RUSH: I’m just gonna be honest here. I have had to work real hard today, folks, to not be bored by all of this shutdown jazz because we’ve all been here. We’ve been here since 1995 and we’re going through the same damn routine. There is not a single thing different here from the Democrat side. The only thing different is we finally have a Republican Party pushing back. But other than that, it’s the same old, same old. And I almost decided, you know what? To hell with this today. I am not gonna get sidetracked and sucked into the same old formula. And then I realized there are people listening who haven’t been listening since 1995 and I owe it to them to treat this as though I’m just learning about it like they are. So here we go. RUSH: Because this stuff infuriates me. The Democrat Party embarrasses me, it infuriates me. The Democrat Party will sell this country down the road for political advantage no matter what. They are hypocrites of the first order, and they are never held accountable on it. 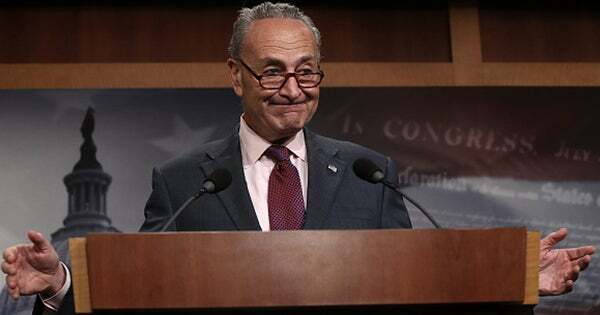 This bill, the sum total, what we’re dealing with, the Democrats have been offered everything they want, and they will not sign it, they will not go along with it. All it would take — well, I’m getting ahead of myself. I’m gonna try to stay organized on this. It’s flat out amazing. They’re getting everything they want. It’s almost like when Clinton offered Yasser Arafat everything he wanted to get Middle East peace, and he walked away. The Democrats are walking away. You know why they walked away? They have to do something about the messaging that’s out there now about the great economy and Wall Street and the tremendous impact the tax cuts are having. I think that Tim Cook’s announcements yesterday are a huge factor in what Chuck Schumer and the Democrats are doing on this. Tim Cook is their guy. Tim Cook is in their corner. Tim Cook and all of Silicon Valley are their guys. And for Tim Cook to announce the largest capital investment in this country in a long time by anybody, 20,000 new jobs, this is the stuff the Democrats don’t want you to hear by focusing the media on this stupid shutdown. Twenty thousand new jobs, $2,500 stock bonuses for employees, a brand-new Apple campus somewhere to be built this year in this country. And there’s Tim Cook in a six-minute story on ABC News crediting the tax cut for a large part of it, crediting Donald Trump. They’ve gotta get that message off the front page. They’ve gotta get that message out of Yahoo News. They’ve gotta make sure that doesn’t get covered. They’ve also gotta make sure that this FISA warrant memo that probably exposes the biggest political scandal in our lifetimes, they’ve gotta make sure that doesn’t make it above the fold. They’ve gotta make sure that doesn’t show up on the front page or as a lead story on any cable news network or newspaper anywhere. So this shutdown business is nothing but a thorough, 100 percent distraction and an attempt to eliminate the positive messaging that has been out there all week long for Trump and the Republicans on the economy. Because the Democrats, when you talk about the election of 2018, don’t have an agenda. Their agenda is Trump is a screw up. Their agenda is Trump is hated. We hate Trump, you hate Trump. Their agenda is Trump is insane, he’s got Alzheimer’s, he’s gonna have a heart attack ’cause he eats McDonald’s on the bed at night, all of that. They cannot permit a never-ending stream of great economic news and improving lifestyle news for most Americans. They cannot permit that. And so anything to change that message or eliminate it. And then, of course, this bombshell memo that exists that members of Congress have now read that makes it pretty clear that this opposition research document that Hillary Clinton bought and paid for was used to get a FISA warrant to spy on Donald Trump. You remember March of 2017 when Trump alluded to the fact that it was just not right for Obama to be tapping his wires in Trump Tower, and do you remember how everybody thought Trump’s an idiot! You can’t say that. There’s no proof of that. There’s no evidence that Obama’s been spying on you. You’re paranoid! You lunatic! The next day or shortly thereafter, Trump moves his headquarters out of Trump Tower and over to his golf club in Bedminster. He was right. He was being spied on. The FISA warrant permitted the Trump campaign and Trump himself and his transition to even be spied upon. So all of that’s gotta be buried. All of that cannot come to life. And so here we are with another government shutdown. And, folks, the Democrats are getting everything they want. They’re getting everything they want, and they’re still refusing it. They want the government to shut down. They want people in this country to suffer. They want there to be pain. Because they are confident the Republicans are gonna get blamed for it. They are confident their buddies in the media will see to it the Republicans get the blame for this. This is all about causing pain and suffering. This is all about creating chaos and having the Republicans get blamed for it. And what’s at stake in all of this? DACA kids, DREAMer kids, depending on the number, 800,000. All of this is being done for the sake of 800,000 illegal immigrants. When you strip it all away they’re illegal immigrants because Obama’s program is unconstitutional. As I pointed out earlier this week, the DACA program does not expire for three or four weeks. There is no reason to shut down the government now or ever. Trump extended the life of the program after saying he was gonna cancel it. A federal judge then came along and told Trump you can’t cancel it even though it’s unconstitutional. So the Trump administration DOJ is now at the Supreme Court begging them to take the case so that they can avoid the Ninth Circus Court of Appeals which would extend this thing for another nine months. And that’s another thing. It kind of bugs me the administration has to ask the Supreme Court. We’re dealing with something that’s clearly, blatantly unconstitutional. Trump canceled it, whacks it and here comes a federal judge out on California, “You can’t do that. That’s too hard on the kids.” The judge is unconstitutional, DACA, the deal that Obama did, is unconstitutional. But even with Trump’s order to end it, it doesn’t happen ’til March! The DACA kids were not gonna be deported this weekend. Nothing was gonna happen this weekend. This was purely a show by the Democrats to cause chaos. “I can’t, mommy, the Republicans shut down the government, I’m starving.” They’ve got the stories ready to go, with everybody blaming the Republicans for this. So where I want to start, I want to start with perhaps one of the most brilliant members of the Trump administration. He’s the director of the Office of Management and Budget. His name is Mick Mulvaney. We have interviewed Mick Mulvaney for The Limbaugh Letter. Mick Mulvaney is a proud Rush Baby. Mick Mulvaney grew up listening to this program right along with his dad. He said so in the interview with The Limbaugh Letter. They sent him out today, had a briefing in the White House, to deal with the media on this. Office of Management and Budget. He knows the money in the federal government and particularly the administration’s budget. And he promptly, in a brilliant messaging maneuver, labeled this shutdown the Schumer Shutdown. That’s right. Name it. Because that’s exactly what it is. But Mulvaney, remember, now, he’s talking to an absolutely brain-dead press corps. They don’t care what Mulvaney is saying. They’re not attempting to learn from Mulvaney. Mulvaney is simply the latest administration figure that they are to attempt to disagree with, destroy, expose, what have you. So the press once again fails the people of this country by not even caring about being properly informed. The only thing the press cares about is the horse race here. The only thing they care about is will the Democrats succeed in blaming the Republicans? The press wants the shutdown. They’ve got the little countdown clocks going. They can’t wait for the shutdown. They’re so excited! They’re more excited over the shutdown than they are about Obama’s election. They’re more excited than they are over Christmas. Wait. They don’t get excited about Christmas. They’re salivating. They can’t wait. So here is Mulvaney. We have two sound bites. Again, he’s the director of the Office of Management and Budget talking about the potential shutdown. MULVANEY: The Democrats in the Senate are opposing a bill that they don’t oppose. They’re for clean CRs. They’re for the extension to the CHIP program. Many of them support the delay of taxes, most specifically the medical device tax, the Cadillac Tax especially. They don’t oppose anything in the bill, but they are opposing the bill. I just want to let everybody know that we don’t want this, we do not want a shutdown, but Mr. Schumer insists on it. He is in a position to force this on the American people. RUSH: Now, hang on. I know a lot of you are probably asking, “Wait a minute, Rush. I don’t get something. How can the Democrats make this happen when the Republicans run the show? 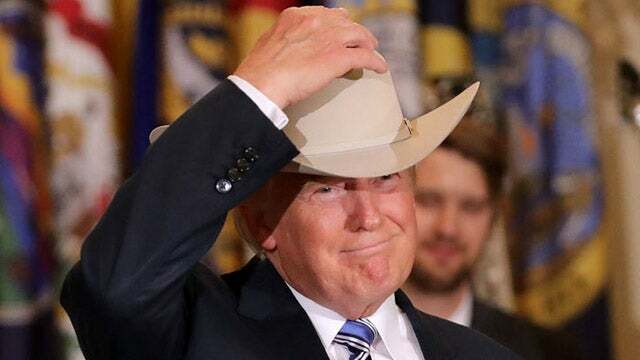 How can the Democrats shut down the government if the Republicans own the House and if the Republicans run the Senate?” It’s actually not a bad question — and I, of course, am the right person to answer it, and I’ll do that in due course. But did you hear this? “The Democrats in the Senate are opposing a bill that they don’t oppose.” They want clean continuing resolutions. This is one. They’re for the extension of the Children’s Health Insurance Program. It’s in there. Many of them support the delay in some of the taxes, the medical device tax, the Cadillac Tax especially. It’s in there. They don’t oppose anything in the bill, but they are opposing it. 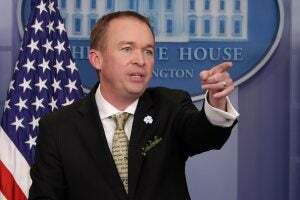 MULVANEY: The Obama administration weaponized the shutdown in 2013. What they didn’t tell you was they did not encourage agencies to use carry-forward funds, carry-forward funds that they were sitting on. Nor would they encourage the agencies to use transfer authority. They could have made the shutdown in 2013 much less impactful, but they chose to make it worse. The only conclusion I can draw is they did so for political purposes. So it will look different this time around. RUSH: Okay, now I expect the press has no idea what he’s talking about there, and I expect that when many of the American people in the audience hear “carry-forward funds,” they ask, “What is that?” Let me explain it to you. Every federal agency has a reserve fund. They have their budgeted number every year, the amount of money they’re given to run — and from that budgeted number, there’s a reserve that’s always held back. This is why near the end of every budget year sometimes there has been advertising for food stamp applicants. Remember this? The federal government advertising, selling food stamps to applicants, running TV and print ads reminding people they might qualify for food stamps. Why did they get the money for this? They get it from the reserve fund. Why are they spending it? Because they don’t want to get any less money in the next budget. What Mulvaney is saying here is that the Obama administration bureaucratic departments did not use their reserve funds. They didn’t spend it. They caused chaos in the last shutdown. There’s always a reserve fund to continue operations. Obama’s agencies did not use their reserve funds, their carry-forward funds. They let things go unpaid for to create the chaos, to create fear and panic so that it would all be blamed on the Republicans. Mulvaney is saying, “We’re not gonna do that. There will not be any pain and suffering. Our departments are gonna use our carry-forward funds during the shutdown.” In fact, Mulvaney at one of the agencies he runs didn’t even ask for any additional funds because he says they have plenty to get through this. ACOSTA: (screaming) How can it be the Schumer Shutdown when Republicans control the White House, uhh, the House, and the Senate? MULVANEY: Come on. You know the answer to that as well as anybody. I have to laugh when people say that. Oh, we “control the House and the Senate and the White House. Why can’t you get this done?” You know as well as anybody that it takes 60 votes in the Senate to pass appropriations bill, right? You know that? RUSH: Yeah. “Jim, you know that.” Jim, you know that, but it doesn’t matter to you. All Jim Acosta wants to do is make it look like the Republicans can’t count to four by adding two and two. Mulvaney says, “It takes 60 votes.” Nobody has 60 votes in the Senate. The Republicans have 52 and they’re gonna lose two. It’s an appropriations bill. You need 60. They don’t have 60. So he’s chiding Acosta. But still, there is another answer besides that. You know, I want to go on TV and start shouting to the American people, “Grow the heck up! Why the hell do you need this thing so much every damn day? Wean yourself off of it! It doesn’t matter if it shuts down. If you didn’t pay attention to the media, you wouldn’t even know it’s been shut down.” In most cases, nobody can even tell. They wouldn’t even know, and the whole point of this — the only reason it’s happening — is so that the Republicans can get blamed for it during a period of amazing, upbeat economic activity, which is a primary determinant in who wins elections. And the Democrats have to get rid of that. They have to cover that message. They have to obliterate it. They cannot allow, they cannot permit that kind of positive reinforcement, reaction, knowledge to be associated with the Republican Party. So if the Republicans control the House and Senate and the White House, then why is this the Schumer Shutdown? Aside from the 60 votes, it’s because the Democrats are not even negotiating. They’re not even giving an inch on one proposal, any proposal. 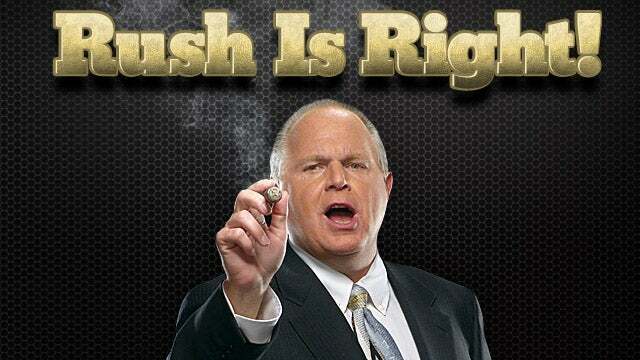 RUSH: Folks, I was serious at the top of the program. I really wasn’t gonna spend any time on this. I was gonna go straight to the FISA warrant memo. That, to me, is a blockbuster story. We’re still gonna get to it, because I’m fed up with this. I’ve been there. This is… I don’t mean to be harping on how many years here. It’s just it’s amazing to me how so much in politics recycles and how it never changes. It just repeats. It’s like it’s in a book or a schedule planner. And with every year whenever the Republicans are in power you know damn well we’re gonna get government shutdown claims. When Republicans are not in the White House but run the House of Representatives, we’re gonna get shutdown talks. It never ends, never fails. It’s the same arguments: “Republicans don’t care! Republicans are mean-spirited extremists, racists, bigots, sexists, homophobes and they hate the poor and want everybody to starve and die!” For 30 years we’ve put up with this, and I’m fed up with this. I’m stick of it. It ticks me off that the game is still played the way it’s been played. Republicans say, “No, we’re not! No, we’re not!” and the media always sides with the Democrats and nothing ever changes about it. And the government sometimes gets shut down. And the next day we’re all still here all breathing, and we’re going about our lives and not a single thing changes! Except the Republicans once again take it on the chin and lose a little image because the Democrats and the media have succeeded in convincing more stupid, idiot Americans that that the Republicans don’t care about people and want them to die and get sick and starve and drown or what have you. I just resent having to participate in this game as often as it comes up. But then, but then, my friends, I caught myself. I remembered that that would have been a very arrogant and selfish way to go about this. I remembered that this audience is growing incredibly. Our weekly cume is up to 27 million, and there are other signs of growth that we use to measure that are also through the roof, which means what? Which means there’s a whole lot of new people listening here who may not have heard the way I opine on this government shutdown stuff and may be tuning in with high expectations and they may be expecting me to nuke this, to inform them, to tell them what’s going on, to comfort them, to inspire them. And I just can’t come in here and blow it off because I’m sick of it. Lou Gehrig never took a day off because he always figured there’s somebody in the stands who had paid money to see him be his best. And I said to myself, “I can’t just sit here and selfishly indulge my own anger and ignore this,” and so we’re not. But I’m telling you, I was tempted. Can you tell that I’m mad about this? I mean, I’ve made it abundantly clear why I’m mad at this. Well, the political… There’s nothing amusing because the joke’s over. The Democrat Party requires poverty. The Democrat Party profits from poverty. The Democrat Party profits from people who are illiterate. They profit from people who are ignorant. The Democrat Party needs an increasing number of them every year to vote Democrat, because as people wise up and as people grow economically, they don’t need the Democrats and the government. So the Democrats have to replace people as they become self-reliant and rugged individualists. And what do they do? They import people who can’t read, who can’t write, who can’t work. But they can vote because they can figure out how to get on a bus and be driven to where you pull a lever and then go back to the tenement where they live where they’ll probably be forgotten about ’til the next two years ’til the Democrats need ’em again! All the while, we’re told it’s the Republicans that are making ’em poor! We’re told it’s the Republicans that don’t care about ’em! In fact, it’s the Democrats who bring ’em in poor, want them poor, and keep them poor by making sure they never learn how to be self-sufficient! Now at least there’s an improvement ’cause we’ve got guy in the White House who’s not gonna put up with this anymore. Now grab audio sound bite 23. This is Lindsey Graham. No, no, I haven’t forgotten. Okay, let me go back first before we get to 23. “How can the shutdown be Schumer’s fault if the Republicans are in the White House and control the House and the Senate?” Folks, it isn’t that hard. Beyond the 60-vote requirement to pass anything in the Senate — and neither party has 60 votes. I meant this when I said the Democrats have been given everything they have asked for. All Trump wants… If I can cut to the chase here, if the Democrats would just give something on the wall — if it’s just a 50% agreement on a down payment — they could have everything else they want because it’s already in the bill that they’re not gonna vote for. They are going for the 100% kill. They do not want a wall. They do not want the Republicans being able to claim victory after anything. They want the government shutdown. You have Lindsey Graham and Rand Paul who are going to vote with Chuck Schumer. They are unwilling to give the Republicans or Trump anything in exchange for amnesty for the DREAMers. That’s what they want, the Democrats and Lindsey Graham and any other recalcitrant Republicans are looking at total amnesty for the DREAMer kids, and they will not give anything in a negotiation sense in return. Somehow the intractability, the inflexibility… Despite them having everything they want, the Democrats are voting against it, and somehow this is the Republicans’ fault. This is how this always works. No matter what happens, it’s always the Republicans’ fault. There’s no need for an emergency on DACA. It doesn’t expire until March.